The Sanskaari Girls Book Club is a space for avid readers to familiarize themselves with South Asian Feminist literature. 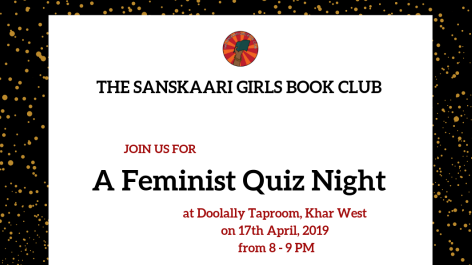 It is organizing a Feminist Quiz NIght for the community to meet up, learn a little and enjoy the evening over some beer! Whether you're a member or not, feel free to join us. Share "A Feminist Quiz Night"